Almost every Saturday morning as a child, while eating my breakfast and getting ready for the day, I sat and listened to Adventures in Odyssey. 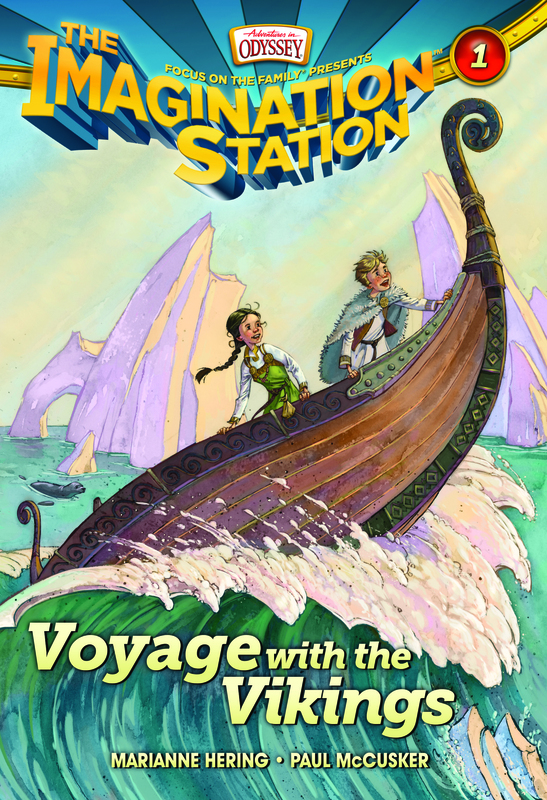 The adventures took me on an auditory ride in the Imagination Station with various characters as they dramatically shared history, scripture, and moral life lessons in a way that I could relate to and understand. The radio series was great because I could create my own characters visually and imagine them role-playing everything that was going on in the stories. Additionally, some of my earliest and fondest memories take me back to the stories I heard on the radio. I looked forward to each Saturday morning when the dramatic readings began. Now, I am honored to have a opportunity to share with you a new Imagination Station book series that Focus on the Family has created. The first book in the series is entitled “Voyage with the Vikings” by Marianne Hering and Paul McCusker. This week on my blog, I will highlight this series and Adventures in Odyssey. The story is a about two cousins, Beth and Patrick, who go on a journey in the imagination station, an invention created by Mr. Whittaker. When they arrive in Greenland they are forced to defend themselves immediately and continuously throughout their voyage. They meet Erik the Red and Leif, his son, who helps them test their faith and their obedience. This adventure is action packed and full of bravery by the two main characters. Beth is very smart for her age and Patrick is a fearless young leader in training. Both children are not entirely typical, but portray characters that other children may like to emulate. The font is large so it helps children keep there place and get through the book quicker. Some children may be able to relate to the books character’s. The action in the book is nonstop. The book takes a complex time in history and gives them just enough information that they can build upon when they learn more about it in the future. The major elements about the Vikings were included, but on a child’s level. Overall, I liked the book; however, I am not sure that most 7 year old kids would find it interesting. Frankly it depends on the child, but if you can get your child to read it, it would peek their interest in history for years to come. I really enjoyed the story, so I would recommend parents read this story with their children. For instance, it would be a great book to have your child read aloud to you before he or she goes to bed at night.